Edit: As the good folks in the comments reminded me - there's an extra fee to take into account! Check the comments for details. Patience. Patience is the core to the art of buy orders. There are other variables when you head to the trading post and look for a likely niche to flip items in, but the patience required... the patience required never changes. If you want to make a bit of money, and feel clever doing so, buy orders are a good bet. I'm aware that, for some of you, I'm preaching to the choir. But maybe you're missing a note or two, maybe you're off key. Maybe the choirmaster (me in this long analogy) wants the choir to share their tips amongst themselves! So even if you're rolling your eyes right now: "yeah, buy orders, I KNOW", have a read - you might learn something. Or you might feel I've left something important out and want to share in the comments or on FB or G+! 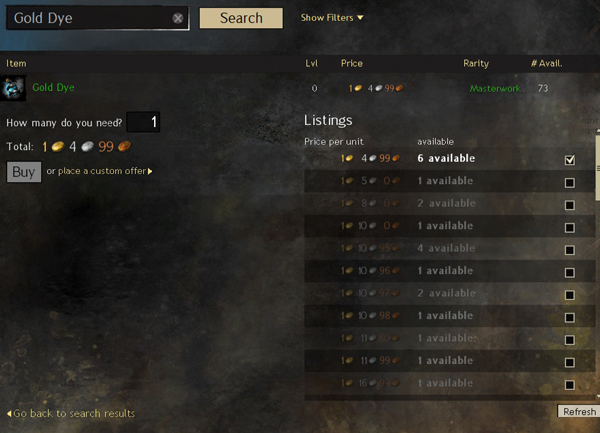 Things to be aware of when you're trying to scope out a potential market at this stage - the total number of items available (# Avail); the price (price per unit) and number (available) of the cheapest listed (1 at 9 silver 10 copper in this case) and the price per unit and available of the next few tiers up (9 at 9 silver 60 copper, then 28 at 9 silver 64 copper - enough for this example). Again, we want to check the price per unit and number ordered at the dearest (10 at 8 silver 38 copper) price point and then the numbers and prices working our way down the tiers (9 at 8 silver 37 copper, 3 at 8 silver 36 copper, then 53 at 8 silver 35 copper - enough for this example). 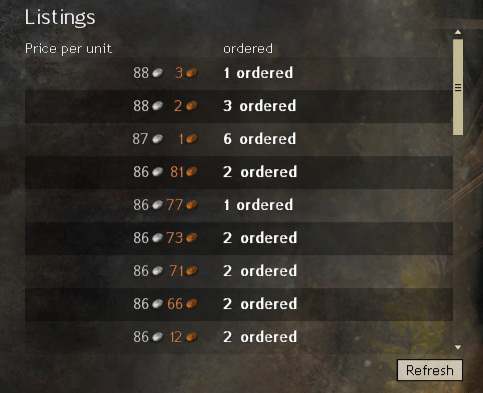 The long and short of the screenshots above is this: you can place buy orders at 8 silver 35 copper to 8 silver 38 copper (depending on how fast you want the item) and most likely find a seller who wants to 'sell to highest buy order' over the next few hours. If you're buying anything because you need it (not for profit) this is the best way to go about it. You'll get the item quick enough and you'll not spend as much as you would for the lowest listed item at that time. Right now we're looking for a flipped profit. To work that out try to sell (anything) in the trading post at the price of the cheapest listing you think will sell over the next few days. Now, this varies depending on how fast the items move and experience is the only thing that'll teach you this. Un-ID'd dyes move fast so you don't need to undercut and don't even need to match the lowest seller. You could probably list at 9 silver 90 copper (250 dyes away) and still sell reasonably fast but understand more will be added to 'lowest seller' and slightly above. For this example let's go for worst case flip - lowest seller and dearest buy order. 8 silver 19 copper gross (after trading post fee). Subtract the 8 silver 38 copper that you spent and you'd have lost 19 copper. Subtract the additional listing fee (46 copper) and things are even less rosey. Although there's potential for profit by putting in a low buy order and a higher sell order (9 silver and 60 copper is a very achievable sale here) this isn't an ideal buy order flipping opportunity. Your gross profit (minus TP fee) if you sell at cheapest listing price. 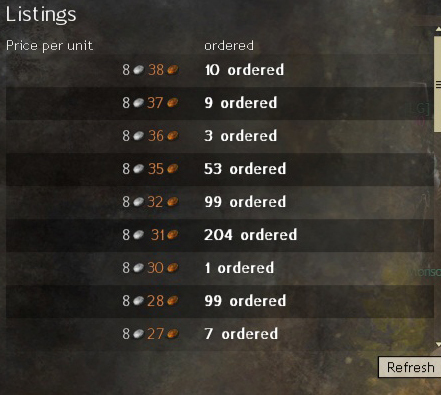 With good, old gold here, as you can see, for every buy order you got at the dearest buy order price (88 silver and 3 copper) sold at the cheapest price listed (1 gold 4 silver and 99 copper) you'd be making 1 silver and 21 copper net profit. Not bad for no real work! To turn that into top notch earnings, you'd need to put in buy orders in bulk. That's not to say gold is the best option on the trading post at the moment - no way! I'd go as far to say that there's no chance, no chance at all that that's the best price difference you can find between max buy order and min listing price. But you can use this technique to easily make a bit of money at will. All you need is patience! What do you guys like to flip? What kind of trading post buy order techniques do you like? One final tip - don't leave buy orders up too long (over 12 hours or so) as it ties up your money and the market might change overnight meaning you're not going to get those orders in for a month or more. Seems like either my math or yours is off a bit. I'm using http://tpcalc.com/ . Buying at 88s3c and selling at 1g4s99c nets 1s21c profit. Over 15 pieces that's only 18s17c total profit. Can't go into details of my individual ventures atm, but there's specific assets that you can easily flip for 100%+ profit in a stable market. It seems like 30% of my money goes to 1-2.5 day buy orders on extremely stable under-valued goods that trickle in (1-2 buys every 5-10 seconds @ 100%+ profit). 20-30% for long term safe investments for crafting materials. The rest I invest into risky highly volatile goods when the profit margin between high buy/ low sell aligns to allow me to fill orders super quickly without much competition. With competition it's very risky, and the profit margin has to be huge to risk losing money on a seller's war. People often don't buy what' slogical. Outdated crafting guides lead a lot of users to buy things that are extremely inefficient to level up on , and sell at a horrid rate. There's potential for profit in that. 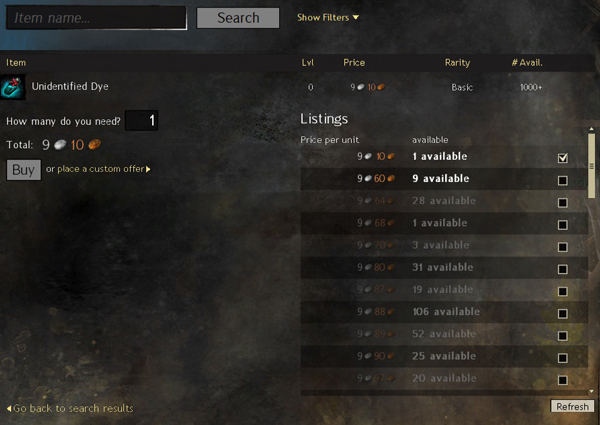 In the gold dye example you left out the listing fee of 5s 25c so your net profit is 1s 21c, not 6s 46c. Check out tpcalc.com and it quickly calculates your profit/loss on flipping items. AFAIK the projected profit is the number you really get back in your trading post window. A non-refundable listing fee of 5% (minimum 1 Copper coin); this is paid when you post and is not returned if you remove the order. Both fees are shown before you press the submit button, however the total shows the gross total, not net profit. Yep you guys are all great and reminded tired me of the extra fee! Thanks for the tips Thundergore. Got any advice for someone looking to efficiently (in terms of time spent) invest 300g-400g per day? I'm probably around novice level TP'er but my bread and butter $ making becomes very tedious after investing about 40g into it. 2) Work within multiple niches but bring your total number of buy orders and listings down. In other words - pick expensive items to barter with. Think ectos, Tier 6 fine mats, exotic armour and weapons, skins and so on. It's very common to use the same set of techniques (low buy orders -> regular priced listings) but new "tiers" of items when upgrading through the 5 gold - 150 gold market; the 150 gold - 500 gold market; and the 500 gold + market (arbitrary division alert but you get the idea). Great - thank you for those suggestions. I was considering a bit of manipulation and really consider that the next level on the TP for myself. Your reply is probably the push off the cliff I needed. If you're tempted to manipulate don't devote too much of your funds because it is pretty tough. I find that, with running the blog and sharing I don't get the time to try the more time intensive techniques out myself to the extent I would like - and trying to corner a market (especially with a global TP) is one of those techniques I'm not as well versed in... but I know some characters are making quite the profit with it.